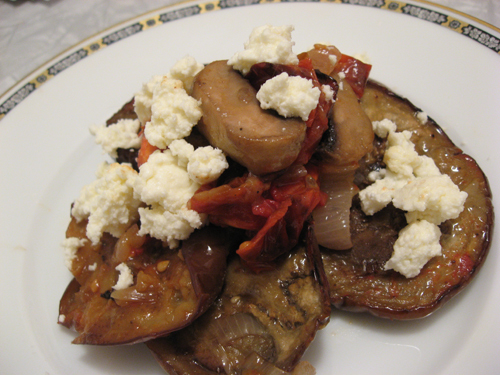 What exactly does ricotta have to do with Sukkot? After all, Shavuot is the holiday that features dairy so prominently. In part it’s a question of ecology: meat is a high-impact food, and if we can all cut down a bit, the planet be much better off. In part it’s a question of health: with all of the heavy holiday meals we’ve been having, a bit of a break seems in order. And in part it’s a question of celebration: just as the harvest enjoins us to pay closer attention to what we grow in the soil, making cheese rather than simply buying it in the store helps in the appreciation department. Plus, it’s a bit of a chemistry experiment, and just plain fun. There are some foodstuffs that we buy in their original, unvarnished form: fruits and vegetables, eggs, milk, meat. And then there are some foodstuffs that we buy already processed: bread, jam, pickles, and so on. These are all things that we could make at home, but for the sake of convenience and efficiency we tend to leave to others. Once in a while, though, it can be incredibly enlightening to take one of these on and make it yourself. When you see the amount of raw fruit, labour and time you need to produce a small half-pint of jam, the seemingly high cost of the jar in the store makes more sense, and the need for properly paying farmers and food producers does, too. We guarantee that you’ll never waste that last little bit in the bottom of the jar once you’ve made a batch yourself. In short, the more you have a hand in producing your own food the more you will appreciate it, and the more you will start to care about its origins, effects on the land, and sustainability. In that spirit, we thought we’d take a first foray into the wonderful world of cheese-making. A very preliminary foray, mind you: there are no caves, specially injected moulds, or aging processes here. Just two ingredients, fifteen minutes, and minimal technique. Milk contains two basic kinds of proteins: casein or milk protein (about 80% of the protein in milk is casein), and whey protein. To make cheese, a small amount of an edible acid (in the form of vinegar, lemon juice, or enzymes) is added to milk, causing it to curdle. The curdling essentially separates out the two kinds of protein: the curds are casein, and the whey is, well – whey. The curds, which contain the bulk of the protein in the milk, are the material from which all cheese is made. Various flavouring agents, aging times and processing methods all conspire to produce the huge assortment of cheeses that we know and love. Ricotta is the simplest kind of cheese to make because it is just fresh, unprocessed curds – no further treatment is required. 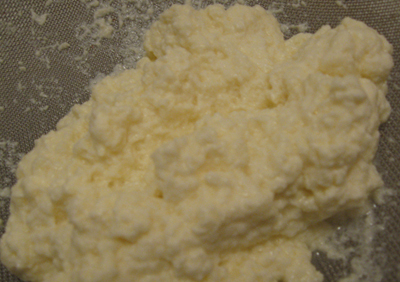 In commercial production, ricotta is made from the whey which is the by-product of the manufacture of other kinds of cheese, like mozzarella. That whey can usually go through a second process of acidification and curdling, yielding up more casein and thus more curds. Since whey is fairly hard to find at the local supermarket, this recipe calls for making ricotta directly from milk. Pour the milk into a medium saucepan and set it over low heat. You want to bring the temperature of the milk up very gradually. Once you see little bubbles start to appear around the edge of the pan, you’re ready for step 2. Pour the lemon juice into the milk, stir once just to make sure it’s distributed, remove the pan from the heat, and leave it alone for 15 minutes. 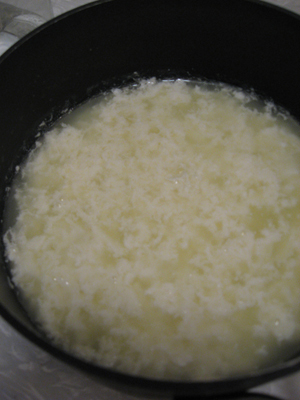 Almost immediately you will see curds start to form. This will look somewhat gross. That’s okay – it’s what’s supposed to happen. Set a fine-mesh sieve over a large bowl and gently pour the contents of the saucepan into the sieve. Leave the curds to drain for about an hour. Stir a couple of times to make sure all the liquid (the whey) has a chance to filter out. Congratulations! You’ve made ricotta. Scrape the cheese out of the sieve to use immediately, or press into a cake, wrap in plastic and refrigerate if you’re setting it aside for later. The whey that drained off into the bowl can be put to good use. Don’t throw it out! Pour it into a container with a lid and stash it in the fridge. It’ll keep for a few weeks, and we’ll be featuring a recipe using whey soon. One of the most shocking things about making ricotta is seeing just how little cheese you end up with relative to the amount of milk with which you started. This is one of those aha moments: the cheese shop won’t seem to be overcharging outrageously once you see the quantity of milk cheese-making requires. So, what to do with all that lovely ricotta? All manner of things, from pasta to dessert. We tossed ours with some roasted vegetables (more harvest celebrating) for a substantial autumn salad. I just made a soft cheese, using a similar recipe. It called for vinegar instead of lemon juice. I was astonished about how much milk was wasted. I’m glad you mentioned it. I am going to make biscuits with the whey as you suggested. But is there anything I can do with the leftover vinegary or lemony milk? Or is it just waste? Saturday I was searching for sites related to Marketing and specifically biscuits market and I found your site.